Total Knee Replacement is a surgical procedure to replace the damaged knee joint with an artificial component known as prosthetics. Inflammatory diseases such as osteomalacia, osteomyelitis, and osteoporosis could be the cause for the knee joint’s damage. 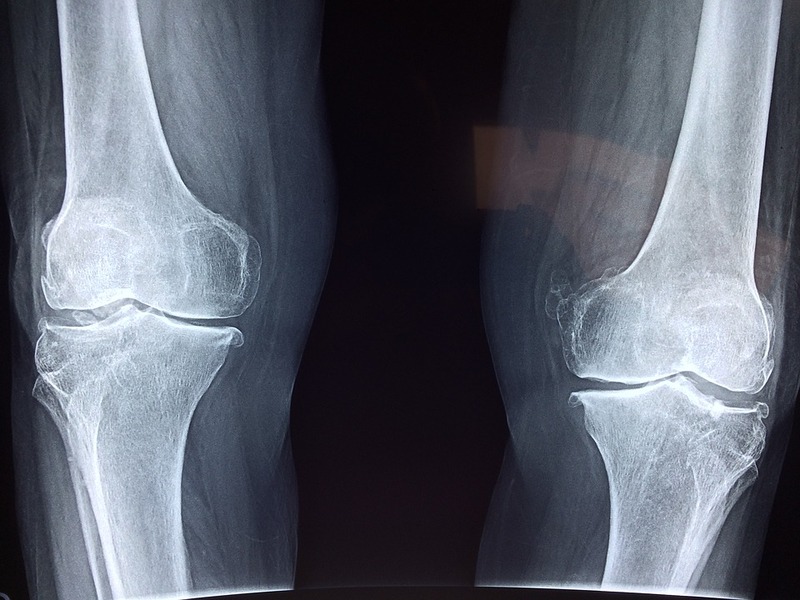 This surgery is suggested for those patients who are suffering from either a severe inflammatory disease, or have a severe knee injury, and also when all the other treatments such as weight loss, exercise, physical therapy, medicines and injections are unable to relive the knee pain associated with arthritis. Joints square measure the tissues that connect bones along and permit them to maneuver. Joints square measure created from tissue and these tissues move as a response to muscle movements. These tissues bear lots of stress over the course of your life. Whereas there's a fluid that stops joints from experiencing an excessive amount of friction (known as secretion fluid), anytime your joints move they receive a tiny low quantity of harm. Generally, the joints regenerate as a response to the present harm. However, over time these joints will degenerate to the purpose wherever they're on the far side traditional repair. This causes the joints to expertise inflammation, and this inflammation is understood as chronic ginglymus sickness. Knee arthritis is the most common type of arthritis. Its symptoms are the pain, swelling, and stiffness in the joint, which makes it hard for people to perform everyday activities, like walking, and climbing stairs. 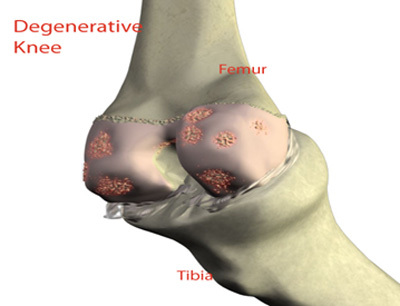 Osteoarthritis of the knee develops slowly and the pain it causes gets worsened over time. Arthritis has no cure but there are a number of treatments that can help in relieving the pain and disability caused by it. Knee Replacement surgery is performed only when the patient is asleep under general anaesthesia. The anaesthesiologist monitors the heart rate, blood pressure, breathing and blood oxygen level of the patient throughout the surgery. An antiseptic solution is then used to clean the skin where the incision is to be made. Now that the knee area is cleansed, the surgeon will make an incision. The surgeon will now remove the damaged surface of the knee joint and replace it with an artificial implant known as prosthetics. An implant or prosthetics is made up of metal and plastic. The prosthetics consists of 3 components: - (a). 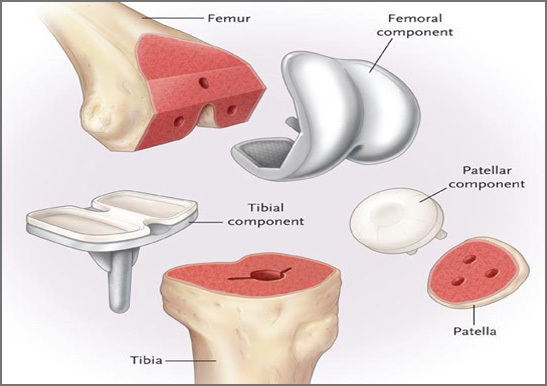 The tibia component (which is used to replace the top of tibia or leg bone), (b). The femur component (which is used to replace the end of femur or thigh bone), and (c). The patellar component (which is used to replace the bottom of patella, otherwise known as knee cap). The prosthetics used to replace the damaged part of the knee is then attached to the bone using surgical cement. A drain could also be placed in the incision site to remove the fluid, if any. The surgeon will now close the incision with either stitches or surgical staples and then apply the sterile bandage or dressing over the stitched area. Pain waking you at night. Deformity- either bowleg or knock knees. Improved quality of life because everyday activities and exercise are easier. Treatment should begin with the most basic steps and progress to the more invasive, possibly including surgery. Not all treatments are appropriate for every patient, and you should have a discussion with your doctor to determine which treatments are appropriate for your particular situation. Following are the range of options. Probably one of the most important, yet least commonly performed treatments. The less weight the joint has to carry, the less painful activities will be. Limiting certain activities may be necessary, and learning new, low-impact exercise methods may be helpful. Use of a cane in the hand opposite the affected knee, or using walking poles, will help decrease the demand placed on the arthritic joint. Strengthening of the muscles around the knee joint may help decrease the burden on the knee. Preventing atrophy of the muscles is an important part of maintaining functional use of the knee. Anti-inflammatory pain medications (NSAIDs) are prescription and nonprescription drugs that help treat pain and inflammation. Cortisone injections may help decrease inflammation and reduce pain within a joint. 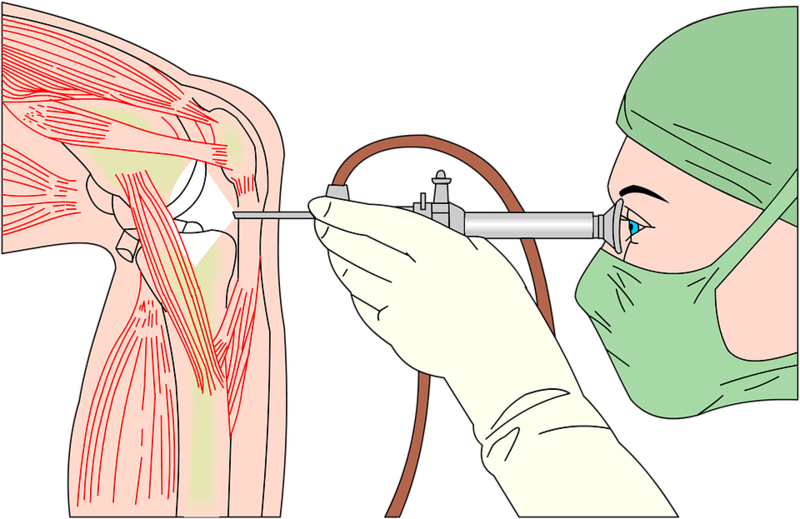 Exactly how effective knee arthroscopy is for treatment of arthritis is debatable. For some specific symptoms, it may be helpful. 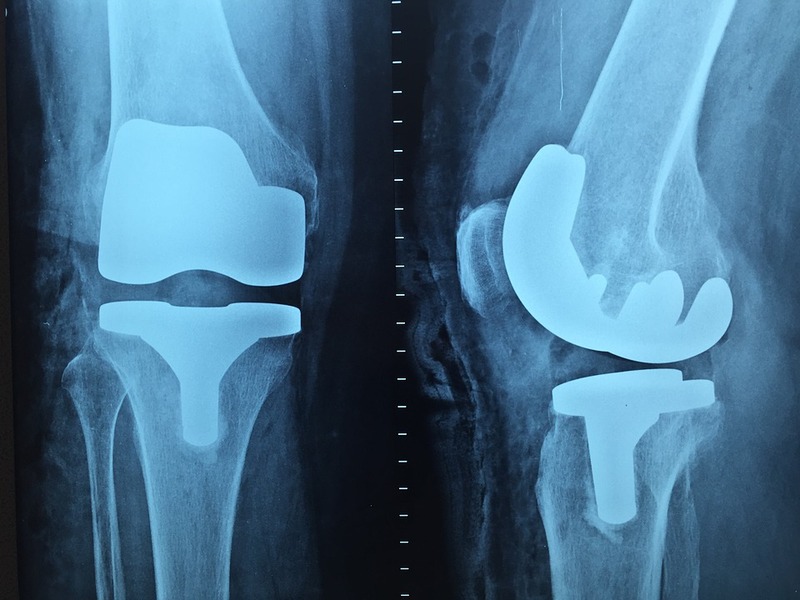 While most patients are not good candidates for this alternative to knee replacement, it can be effective for young patients with limited arthritis. 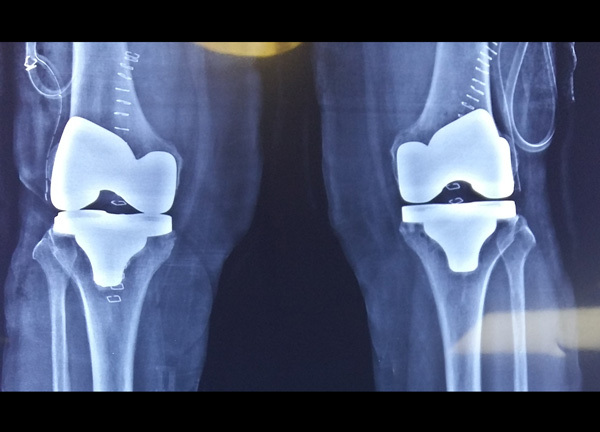 In this procedure, the cartilage is removed from the entire knee joint and a metal & plastic implant is inserted in its place. Knee replacement surgery is among the most commonly performed orthopedic surgical procedures..
Also called a unicompartmental knee replacement, this is replacement of one part of the knee. It is a surgical option for the treatment of arthritis limited to only a portion of the knee joint.